The project is located in Co. Kilkenny, Ireland. We were asked to design an extension to the side of an existing bungalow. Our objective was to design a bigger kitchen and move the dining room into the new extension. Rather than trying to mimic the existing architecture, we decided to design a contrasting contemporary form. 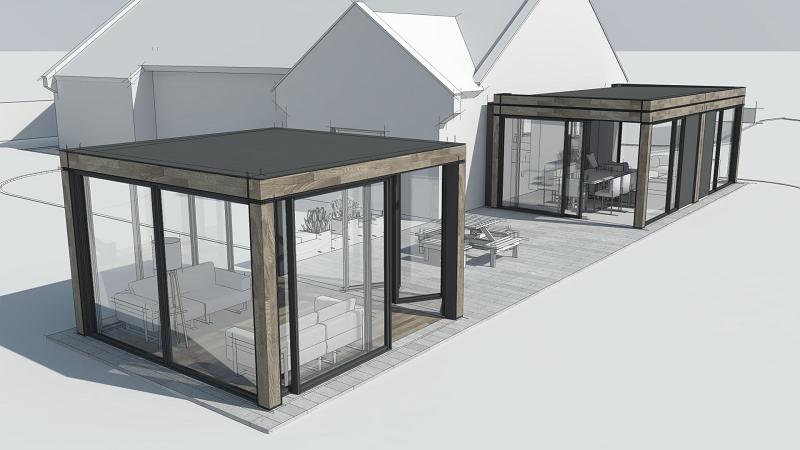 Outside, we designed a garden “pod” as an additional living/dining space in the garden. The pod was designed as a light timber/steel structure with large sliding glass panels to provide flexible protection from wind while allowing for maximum sun exposure. Both the extension and pod are consistent in style and finishing materials and connected by a rectangular stone patio.